[22 April 2011] – A landmark UN-HABITAT resolution on gender equality paves the way for grassroots women to realise their rightful place in global decision-making spaces, with full recognition of their crucial role in human settlements and sustainable development work. The resolution “Gender Equality and Empowerment of Women in Sustainable Urban Development” was passed by the 23rd Governing Council of the United Nations Human Settlements Programme (UN-HABITAT) last week, after the Huairou Commission delegation worked with many partners toward its successful passage. The resolution calls for the formation of an Advisory Group on Gender to the Executive Director, where members will have a say in guiding the work of UN-HABITAT, monitoring gender mainstreaming and oversee the implementation of a gender equality plan. The Advisory Group will be comprised of representatives from government, grassroots organisations, local government, private sector and associations of professionals. It also mandates the strengthening of the Gender Mainstreaming Unit and the gender focal points of UN-HABITAT. It encourages the agency to incorporate a gender perspective into all levels of its work. Concrete steps call for the establishment of a consultative mechanism between all UN agencies working on human settlements, including the new UN WOMEN, to promote coherence and coordination between the agencies on ensuring gender equality and women's empowerment. This is the first time that a UN-HABITAT resolution has given such importance to grassroots women’s organisation and representatives, and truly given them a seat at the table. Grassroots women and community-based organisations will have a representative on the advisory group under this resolution, and they must be directly included in consultation processes. The resolution firmly recognises the importance of grassroots women in this work and supports their participation and leadership. It explicitly recognises the “major development contributions made by grassroots women worldwide”, and the fact that “successful urbanisation and development processes require grassroots women’s involvement and leadership”. The resolution also offers support to grassroots women’s local development work, affirmed as vital for sustainable urbanisation. 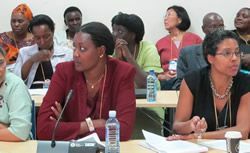 Grassroots women leaders, Coordinating Council members and stalwart partners in the Huairou Commission were a central force behind the drafting and passage of this resolution, demonstrating the importance of organising through networks and holding daily women’s caucuses to collectively strategies at global policy events. Grassroots women and NGO leaders from the Huairou Commission lobbied their governments at the Governing Council to support the resolution, working hand-in-hand with the UN-HABITAT Gender Mainstreaming Unit and government representatives. It was sponsored by the governments of Ghana, Norway, Tanzania and Zambia, and received inputs from Brazil, the U.S. and other countries. Huairou Commission members Grassroots Sisterhood Foundation of Ghana, Maasai Women's Development Organization of Tanzania, Katuba Women's Association of Zambia and Espaco Feminista of Brazil particularly led the civil society efforts by lobbying their governments. The entire Governing Council, consisting of 58 member states, unequivocally approved the resolution on Friday 15 April. The Huairou Commission and its vast network of women in 54 countries will be following the implementation of the consultative process and the advisory group closely. Commission members surely look forward to ensuring grassroots women effectively claim their seat at the decision-making table, where they belong.